Pancreatic Cancer Action is the first UK charity to try to provide a practical solution to the problem of late diagnosis of pancreatic cancer. 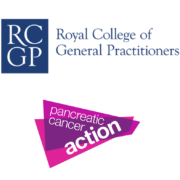 We have worked with the Royal College of General Practitioners (RCGP) to develop free online interactive training on pancreatic cancer. The module, “Pancreatic Cancer: Early Diagnosis in General Practice” has been designed and written by specialists in the field and overseen by practicing GPs. The module is free to access, is hosted on the RCGP website and medical professionals will be awarded Continuing Professional Development (CPD) credits for taking part in the course. There is no need to be a member of the RCGP to take this course – but you will have to register with the e-learning part of their website to use the education tool. The GP e-learning programme uses a case study format with video footage adding variety and reality and enables GPs to assess and improve their knowledge in the field of pancreatic cancer. If you would like to make your GP aware of the e-learning module, you can order flyers here.